Gyrotonic studios in NYC offer one-on-one training, small group classes and trial packages for newcomers. How does Jane Seymour maintain a sleek physique at 65 and Madonna thrive in her pop star prime? The secret could be their fitness regimes that includes Gyrotonic exercise. Using elements of dance, Tai Chi, yoga and Pilates, Gyrotonic is a unique exercise method that can help lengthen, strengthen and tone your body, increase your flexibility and instill you with energy using specialized equipment under the guidance of certified trainers. When Gyrotonic debuted nearly 40 years ago, it was designed primarily for dancers, but it’s been catching on more recently among professional athletes, celebrities and ordinary people seeking a more holistic workout. Gyrotonic equipment offers a wide range of exercise options to facilitate working your entire body. The most widely used is a tower with a weighted pulley system that can be customized for all levels. Using the tower, individuals experience a dance-like flowing sequence of fluid spiraling and rotational movements that help improve their range of motion and provide a cardio workout without the jarring of higher impact activities. These pulleys provide constant resistance for strength training without heavy lifting. A leg extension unit, a jumping and stretching board and a more advanced archway complete the equipment line. Gyrotonic methodology was developed in the 1980’s by the Romanian-born Hungarian Juliu Horvath. Trained as a professional dancer, Juliu defected to the U.S. in 1970 and performed with Radio City Music Hall, the New York City Opera and the Houston Ballet Company. When injuries forced him to retire from dance, he focused on yoga, meditation and holistic health practices to heal himself. Buoyed up by these experiences, he began teaching yoga to dancers and creating new movement techniques that became the foundation for Gyrotonic. His philosophy embraces “exercise as a creative and delightful experience.” Juliu, now 74, travels across the globe bringing Gyrotonic to new people and places: Primarily due to his efforts, there are 13,000 Gyrotonic trainers in 84 countries. But becoming a Gyrotonic trainer is no simple walk in the park: There is a rigorous program that involves several levels of mastery. I popped into Gyrotonic on Broadway, where I met owner and master trainer Naoko Moriyama-Robbins (left), who came to the U.S. from Japan as a dancer and dance teacher 30 years ago. Petite and trim at age 60, she earned her master’s certification in 2009 and opened her studio at 928 Broadway six years ago. Naoko credits Gyrotonic for helping her recover from a series of injuries to her hip and ankle that resulted from dance movements and she prefers the method to other types of exercise. “As dancers, we need to learn how to move our bodies effectively in order to maximize our potential,” says Naoko, who loves the happy and satisfied feeling that Gyrotonic exercise provides, leaving her in good spirits after the workout. Naoko explained that the Gyrotonic movements are symmetrical and work in conjunction with your breath, enhancing your aerobic capacity. “We don’t hold poses,” she explains, “instead we move fluidly. There is a releasing and opening of the joints.” The equipment, all designed by Juliu, helps support your body. Naoko’s second-floor studio is small and intimate, offering a tranquil escape from the Broadway crowds below. She prefers a private environment where she can see each student’s issues. Although Naoko is not a doctor, she has helped students find relief from back pain and old injuries by improving their posture, strength and stamina through Gyrotonic. While most trainers are former dancers, nowadays physical therapists and other health practitioners are seeking certifications. Typically, Gyrotonic studios offer either one-on-one training or duets—two students working with one trainer—or a group class, depending on the size of the studio. Most programs offer one or two introductory sessions so that newcomers can try out the method. Afterwards students can sign up for a series of sessions. Naoko recommends doing Gyrotonic at least once a week for maximum benefits. 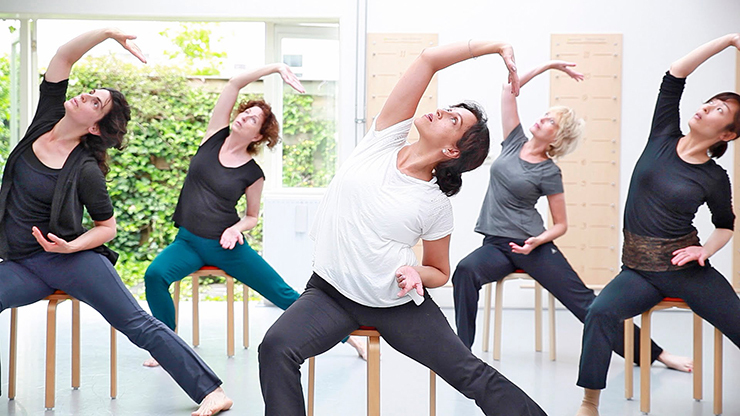 Many studios additionally offer Gyrokinesis—also created by Horvath—a floor-based group movement class (above) based on many of the same principles as Gyrotonic. Trial package for newcomers: $240 for 3 private Gyrotonic sessions and 2 group Gyrokinesis classes. Introductory Package: 2 private sessions for $140 ($70 each). Absolute Beginner Classes: Monday at 7 p.m., Tuesday at 8 p.m., Wednesday at 7:30 p.m. and Saturday at 2:30 p.m. $35 per class. One-hour intro private session: $70. Pilates with a Twist, Pilates & Gyrotonic in Midtown, single private session: $100 + tax. Multiple session value cards are available. A private session starts at $110 per hour; 10 sessions cost $1,000; a duet for two people costs $70 per person and a solo hour session with a master trainer costs $150 per person. Introductory private session for newcomers: $50. Full schedule of new beginner and beginner classes with multiple session packages available. Group classes start at $36 with multiple session packages available. Private and duet sessions with pricing based on level of the trainers.